Does it do practical? | What Car? Let's face it, the Fiat 500 was never the most practical starting point, was it? Although there's plenty of room for the front two occupants, there's not much space for anyone in the back or for baggage in the boot. Those tall race-style seats will also block the view forward for anyone sitting in the back. The 500 isn't blessed with masses of in-car cubbies, either, but build quality is reasonably good. However some of the dash-top plastics remind you that this is a car that you can buy, in standard form, for 8000. 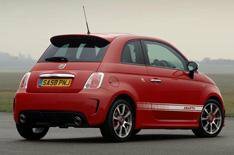 As with all 500s, though, the Abarth should be a sound investment. Only 700 will come to the UK this year, and of those, over 400 are already sold. So expect resale values to remain strong. As with the standard car, the Abarth 500 comes nicely equipped, but there's a long list of personalisation options. They're all reasonably priced, too: the navigation system is 240, a glass roof costs 325 and leather seats are 800. Then there are the stickers anything from a chequered roof (135) to an Abarth scorpion decal (75) and side stripes with coloured mirror housings (160).